ICPRB has created fun maps of recreational access to the Potomac River. Each map contains geographical information, historical details, and other fun facts about our Nation’s River. Maps of the Lower Potomac River are available for download below. 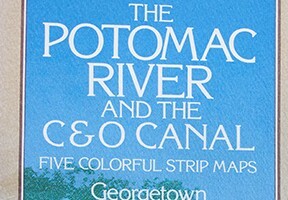 A set of the Upper Potomac River maps are printed on elegant, water-resistant paper and are available for purchase. The Potomac above Washington, D.C. is a fascinating river. Leaving the confines of the city, it quickly sheds its urban character and becomes a near wilderness, full of history and wildlife. Alongside the river for 184 miles winds the Chesapeake and Ohio Canal, an engineering milestone of the 19th century. Begun in 1828, the canal took two decades to complete. When finished, it boasted 74 locks, 11 stone aqueducts, and seven dams to feed the waterway from the Potomac. Maintained by the National Park Service, the canal is one of the best ways to reach the Potomac for recreation. However, floods have long ravaged the canal. Today, only the 22 miles from Washington, D.C. to Seneca (maps 1-4) are watered. The remaining sections are dry. These maps span 92 miles of the most popular part of the river and canal above Washington, D.C. Each map is available for downloading and printing in a convenient PDF format. Each one shows a portion of the Chesapeake and Ohio Canal in the Lower Potomac River area. The “Introduction” page gives more detail on individual maps. Map 1 and Map 2 include Great Falls–the river’s spectacular change from a free-flowing river to a tidal estuary at Little Falls. Map 3 and Map 4 include Seneca and the Seneca slack water area, popular for recreation behind one of the canal dams. Map 5 and Map 6 take you around Point of Rocks, where the B&O Railroad fought a bitter legal battle with the canal company. Map 7 and Map 8 go through the Blue Ridge and the Potomac’s confluence with its great tributary, the Shenandoah River at Harper’s Ferry. Map 9 and Map 10 include areas of the Potomac that saw great bloodshed during the Civil War battle at Antietam. Elegantly printed map sets of the Upper Potomac River from Shepherdstown, W.Va., to just upstream of Cumberland, Md. area are available for purchase.